LET’S ACCEPT IT! FOOD IS AN INTEGRAL PART OF INDIAN FESTIVALS. 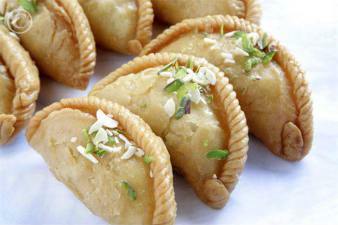 EACH AND EVERY FESTIVAL BRINGS WITH IT THE JOY OF THE FESTIVAL AND CEREMONIOUS FOOD THAT IS AWAITED FOR ALL YEAR LONG. 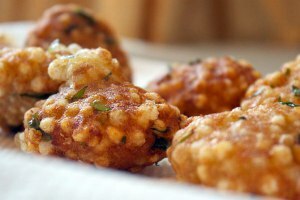 CHECK OUT THESE DELICIOUS AND UNIQUE FOOD RECIPES AND PICK WHICH ONE IS YOUR FAVOURITE! IF YOU LOVE CRISPY, FLAKY EXTERIORS OF A SNACK WITH A SWEET FILLING INSIDE, THIS IS THE PERFECT FESTIVE SNACK FOR YOU. ALSO, YOU CAN MAKE A BATCH OF THIS FESTIVE SNACK AND STORE IT IN AIR-TIGHT CONTAINERS. HERE’S HOW YOU MAKE IT. 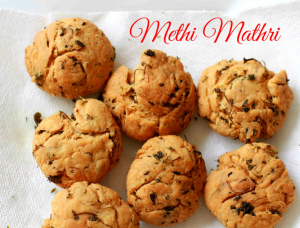 INGREDIENTS: 2 CUPS PLAIN FLOUR, 4TBSP GHEE, ½ TSP SALT, OIL FOR DEEP FRYING. FOR THE FILLING: ½ CUP DRY COCONUT, ½ CUP MAWA, ¾ CUP POWDERED SUGAR, 1 TSP CARDAMOM POWDER, A FISTFUL OF PISTACHIOS, ALMONDS AND CASHEWS. DIRECTIONS: IN A BOWL, ADD THE FLOUR, SALT AND GHEE. ADD ENOUGH WATER TO MAKE A FIRM DOUGH. DIVIDE THE DOUGH AND SHAPE INTO SMALL BALLS AND KEEP THEM ASIDE. HEAT A PAN, ADD ½ TBSP GHEE, ADD GRATED COCONUT AND ENSURE IT’S WELL ROASTED. IN THE SAME PAN, ADD A TBSP GHEE AND ADD THE MAWA + CASHEW NUTS. REMOVE AND MAKE A COARSE POWDER ONCE THE MIXTURE COOLS DOWN. MIX POWDERED SUGAR AND A PINCH OF CARDAMOM POWDER WITH THE MIXTURE. NOW ROLL EACH BALL AND SPREAD A TBSP OF THE FILLING IN THE DOUGH. 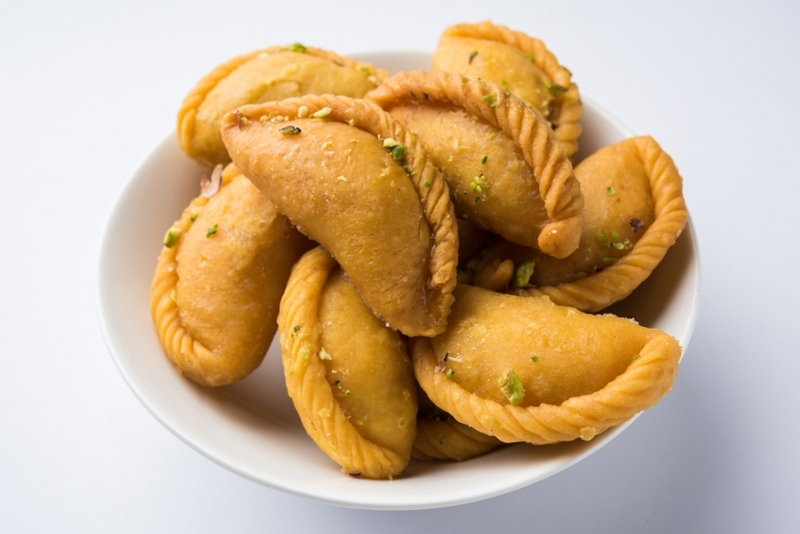 PRESS THE FILLING FIRMLY AND HEAT ENOUGH OIL IN A WIDE VESSEL TO DEEP FRY THE GUJIYAS. COOK THEM TILL IT TURNS GOLDEN BROWN AND DRAIN THE EXCESS OIL. TRY THIS QUICK AND EASY FESTIVE SNACK TO WOW YOUR GUESTS DURING TEA-TIME OR ACTUALLY, ANYTIME. BEST PART ABOUT THIS SNACK? YOU CAN HAVE SECONDS. INGREDIENTS: 1 ½ CUP FLOUR, ½ CUP WHOLE WHEAT FLOUR, 1TBSP RAVA, 1/4TH TSP BLACK PEPPER POWDER, 4TBSP GHEE, 1TSP CUMIN SEEDS, SALT AND OIL. DIRECTIONS: IN A STAINLESS STEEL VESSEL, ADD FLOUR, CUMIN SEEDS, GHEE, AND SALT AND COMBINE WELL. MAKE SURE THE MIXTURE RESEMBLES LIKE FINE BREAD CRUMBS. SLOWLY ADD WARM WATER AND KNEAD INTO A STIFF YET PLIABLE DOUGH. ROLL THE DOUGH INTO SMALL BALLS AND INTO SLIGHTLY THICK PURIS. HEAT OIL FOR DEEP FRYING IN A VESSEL ON THE MAHARAJA WHITELINE INDUCTION COOKTOP. PLACE 6 – 8 MATHRIS AND FRY THEM TILL GOLDEN BROWN. STORE THEM IN AIR-TIGHT CONTAINERS. OH YUM! 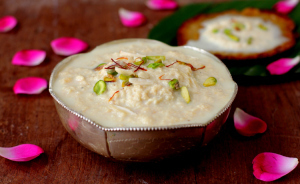 THIS TRADITIONAL RICH AND CREAMY SWEET DISH IS MADE IN INDIAN HOUSEHOLDS DURING THE FESTIVE OCCASIONS. FOLLOW THE RECIPE AND IT’LL TASTE DELICIOUSLY GOOD! INGREDIENTS: 2 CUPS MILK, 2 BREAD SLICES, 1/4 CUP CONDENSED MILK, 2 TBSP SUGAR, 1/4 TSP CARDAMOM POWDER, SAFFRON STRANDS. DIRECTIONS: REMOVE THE CRUSTS OF THE BREAD SLICES AND GRIND THEM IN MAHARAJA WHITELINE’S FOOD PROCESSOR TO MAKE FRESH BREAD CRUMBS. KEEP THEM ASIDE. BRING THE MILK TO BOIL IN A HEAVY BOTTOMED PAN. ADD THE FRESH BREAD CRUMBS, CONDENSED MILK AND SUGAR AND COOK ON A HIGH FLAME, WHILE STIRRING CONTINUOUSLY FOR ABOUT 10 MINUTES. ADD THE CARDAMOM POWDER AND SAFFRON AND MIX WELL. REFRIGERATE FOR 2 TO 3 HOURS AND SERVE CHILLED. TIP: YOU CAN FLAVOUR THE DISH WITH NUTMEG POWDER TOO. HERE’S ANOTHER TASTY IDEA ON THE LIST OF FESTIVE SNACKS FOR THE FAMILY! 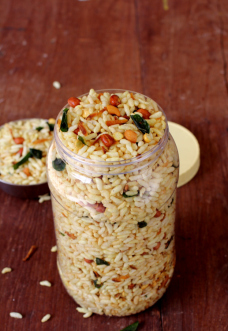 INGREDIENTS: PUFFED RICE – 250 GMS, ROASTED PEANUTS – 1/2 CUP, CASHEW NUTS – 1/4 CUP, ROASTED CHICKPEAS – 1/3 CUP, DRIED COCONUT – 1/2 CUP, GRATED, GREEN CHILIES – 6-7, CURRY LEAVES – 2 SPRIGS, SUGAR – 1 TSP, TURMERIC POWDER – 1/4 TSP, RED CHILI POWDER – 1/2 TSP, SALT TO TASTE (APPROX 1/4 TSP) AND OIL – 4 TO 5 TBSPS. DIRECTIONS: HEAT OIL IN A PAN. ADD GREEN CHILLIES, TURMERIC POWDER, RED CHILLI POWDER AND SAUTÉ TILL THE CURRY LEAVES BECOME CRISP. ADD ROASTED PEANUTS; ADD DRIED COCONUT TO SAUTÉ FOR ANOTHER MINUTE. ADD PUFFED RICE AND MIX WELL. ADD SALT + FRIED PEANUTS AND MIX IT WELL! LET THE MIXTURE COOL DOWN COMPLETELY AND STORE IN AN AIR-TIGHT CONTAINER. THIS QUICK AND EASY FOOD DISH IS IDEAL FOR THOSE DAYS WHEN YOU’RE FASTING ON AUSPICIOUS FESTIVE DAYS. IT IS NOT ONLY YUMMY, BUT A BUDGET-FRIENDLY RECIPE TOO! DIRECTIONS: WASH THE SABOODANA SOAK COVERED WITH WATER FOR ABOUT AN HOUR. DRAIN IN A COLANDER, AND MIX IN POTATOES, SALT, PEANUTS, CHILLI POWDER, CORIANDER, GREEN CHILLIES AND THE LEMON JUICE. FORM MIXTURE INTO FLAT, ROUND VADAS AND FRY IN HOT OIL. KEEP THESE RECIPES HANDY ANYTIME WHEN YOU HAVE GUESTS OVER AT YOUR PLACE DURING FESTIVITIES, EVERYONE WILL THINK YOU’RE A GENIUS IN THE KITCHEN! WHAT ARE SOME OF YOUR FAVOURITE, DELICIOUS FESTIVE RECIPES?